The Memorial Candle Program has been designed to help offset the costs associated with the hosting this Tribute Website in perpetuity. Through the lighting of a memorial candle, your thoughtful gesture will be recorded in the Book of Memories and the proceeds will go directly towards helping ensure that the family and friends of Roland Salvatore can continue to memorialize, re-visit, interact with each other and enhance this tribute for future generations. 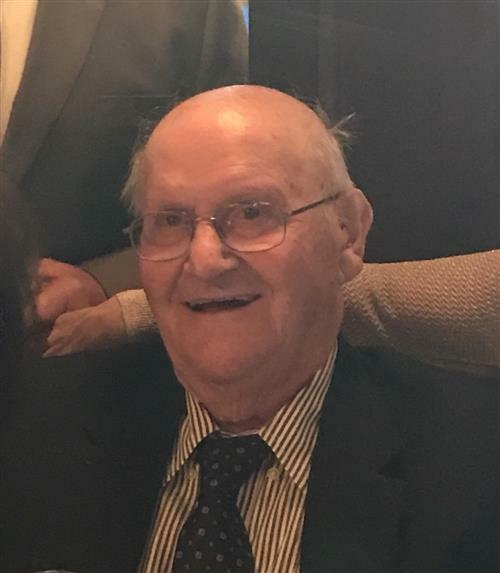 Roland H. Salvatore, 94, of Orlando, FL, formally of Simsbury, husband of the late Frances (Tusia) Salvatore, died, Wednesday, May 30, 2018. He was born May 11, 1924 in Simsbury, son of the late Alfredo and Domenica (Trocchi) Salvatore and had been a life long resident of Simsbury, just recently moving to Florida. Roland was a veteran of the U.S. Army having served in World War II. Mr. Salvatore was employed at Kaman Aerospace for many years prior to his retirement. He was a member of St. Mary’s Church in Simsbury. Roland enjoyed gardening and spending time with his family. He is survived by his children, Joann Torgersen and her husband Ted of Orlando, FL, Roland Salvatore, Jr. and his wife Carol-Ann of Avon and Rose Spradlin and her husband Michael of Simsbury; grandchildren, Christina Bristol and her husband Sean, Roland Salvatore, III, Nicholas Salvatore, Jack Mulcahy, and Ian Spradlin; great granddaughter, Alexa Bristol; his sister-in-law, Retta Davis and several nieces and nephews. Friends may call at the Vincent Funeral Home, 880 Hopmeadow Street in Simsbury on Friday, June 8th from 5:00 PM to 7:00 PM. Funeral will be Saturday, June 9th, 9:15 AM from the funeral home, followed by a Mass of Christian Burial at 10:00 AM at St. Mary’s Church in Simsbury. Burial with Military Honors will follow in Simsbury Cemetery. In lieu of flowers memorial donations may be made to Farmington Valley VNA, 8 Old Mill Lane, Simsbury, CT 06070. Please visit Roland’s “Book of Memories” at www.vincentfuneralhome.com for online condolences.